"Use your clutch properly, Moira, you're coasting"
I saw a learner driving through the red light, he must be a bit wet behind the gears. "Don't affect me, I'm on me bike." "It's a good job we're driving a Ford." Britain & EU agree compromise on Irish border issue. It's all very well but we're trying to launch the lifeboat here! Give way to white horses. Perhaps we shouldn't have put the train line there in the first place. Where's Moses when you want him? It's ok i'll make it round I drive a mercedes sea class. My other car's a submarina. Take the town by storm. "Where's that crossing lifeguard at?" "...and look out for kerb trawlers." The Little Mermaid turns to prostitution. "The sea yields to no-one." I couldn’t go if I wanted to, I’m tide up. "The waves continued to crash on the ocean Banksy." Winning caption in the annual Estate Agents Caption Contest: "A traffic-stopper, this luxury apartment has its own outdoor pool". Nemo leaves Father Christmas a little reminder. What silly Cnut put that there? "Are you sure this is the Giant's Causeway, love?" The town was becoming overrun with 'Mussel Cars'. 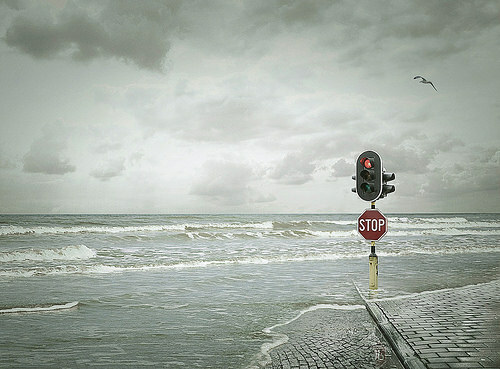 "THERE, now swimmers will be swept out to sea, but NOT without a sign." Don't try to barge in. It was a very disappointing New Year's morning for the Polar Bear Swimming Club.